The majority of the jobs that we do are custom so it is difficult to give car wraps cost and sign pricing guidelines that will apply across the board. However, here are some common signs that we make with their prices. Call (972-686-1155) or email us ([email protected]) and we will be happy to provide you a quote for your job. Note that all of our car wraps cost and sign pricing includes the artwork design at no charge. In some unusual cases, we have charged a design fee but it is rare. For example, we needed to recreate the glass for a pinball game from scratch. Our client had a low-resolution image of the original piece that had been shattered during a move. We had to completely recreate the image which took hours. Here is a simple matrix of some common jobs that we do. You can see the explanations below. For a 24″w by 18″h, double sided, full color, digital print (which could include any type of image), including the stake it would be $22.95 plus tax. The Ziglar sign shown above left is an example of this type of sign. However, if you need 50 signs that are 24″w by 18″h, double-sided, with two color artwork (the artwork can still be a digital image but will NOT be full color), including the stake then the pricing for this sign will be $8.69 each plus tax. 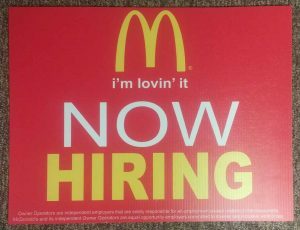 The McDonald’s “Now Hiring” sign is an example of a two-color sign: yellow and red. White is not considered a color though it is incorporated into the design. The white “NOW” and white text at the bottom of the sign are areas not printed red: they are the color of the sign. This means that you can have three color signs as long as one of the colors is white. Sample Banner Sizes: Goodyear is 6’w by 3’h; Pepsi is 8’w by 4’h; garden is 10’w by 4.5’h. A full-color banner, with any digital image you wish to include, 6’w by 3’h with grommets and sewn edges is $92.10 plus tax. We printed a banner that we display at our shop (see image to the right) that shows three sizes of banners so you can get a sense of how large of a banner you need. Banner pricing is a function of size along with other variables including: will it be double-sided, are grommets needed, and does the edge need to be sewn. MDO board is a special wood that can be used outdoors. It looks similar to plywood, however, we can either print it directly or apply cut vinyl based on the design that you want. Accurate Signs has done many 4′ by 4′ real estate signs over the years. We fabricate two faces, each on their own boards, and then attach them to 10′ tall 4″ by 4″s. Installation can be included if needed. For one of these signs, it would be $582.29 plus tax. The pricing for MDO boards, like all of our pricing, is based on a number of variables. Please call and we will provide you with a quote. 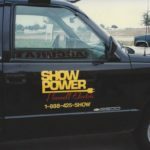 One of our most common jobs is putting the company name and contact information along with DOT and other license numbers on business vehicles. We can do this for about $100 plus tax depending on what you need and includes installation. Pricing is dependent on the number of colors you want to use, the complexity of the design, and the total are you want to cover. The photo to the left shows the space that is typically used for door vinyl. 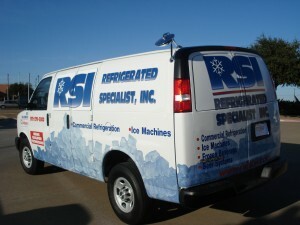 We can also add license number lettering across the front fender or additional information across the bed of the truck. See the photo above. Car wraps cost varies widely, depending on the size of car and design needs. From around $500 for lettering and simple decorative stripes or other graphics to $4,000 or more if you want a complete vehicle wrap. However, we recommend a partial wrap that runs in the $1200 to $2000 range. Here is a photo gallery of our work.